Calais overlooks the Strait of Dover, the narrowest point in the English Channel, which is only 34 km (21 miles) wide here, and is the closest French town to England. Selection of local Accommodation in Calais. Cottage Hôtel 3-star hotel Accommodation. 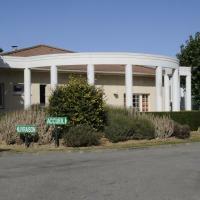 Cottage Hotel is located in Calais, 800 metres from the town centre and Calais-Ville Train Station. It offers free Wi-Fi access, just 9 km from Cap Blanc Nez. Free parking with video surveillance is provided. The Cottage Hotel is situated 300 m from exit 43 on the A16 motorway and 1 km from the Eurotunnel terminal exit. Score from 311 reviews: Superb 9.1 Latest booking: 5 hours ago There are 2 people looking at this bed and breakfast. Located in a quiet street in the centre of Town, Le Cercle De Malines is a guest house set in an elegantly decorated 19th century house. Guests are invited to relax in the garden. All of the uniquely decorated rooms offer a welcome tray with a Nespresso machine and a private bathroom with free toiletries and a hairdryer. Some rooms also feature a spa bath, a walk-in shower or Venetian furnishings. A continental breakfast with eggs, ham and fresh bread is available every morning in the breakfast area. A glass of champagne, wine or beer can be enjoyed in the guest house’s lounge. You will also find easy access to Eurotunnel, the car-ferries and the main shopping centres. The theatre is just 400 metres away and private parking is available on site. € 50 Average price per nigh. 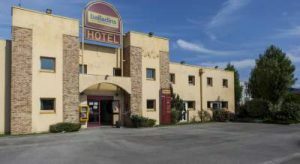 Rooms at the Balladins Calais Hôtel are equipped with a work desk and a telephone. They each have a private bathroom. A full buffet breakfast is served every morning at the Hôtel Balladins. The hotel also provides free on-site parking. 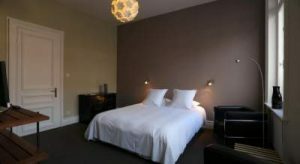 Located in central Calais, this hotel is 3.6 km from the Beach and 2.4 km from Calais Lighthouse. The Musée des Beaux-Arts et de la Dentelle is 2.2 km away and Lille-Lesquin Airport is 95.8 km away. Located in the city centre, a 10-minute walk from the Ferry Port, this Campanile hotel features air-conditioned rooms and an equipped meeting room. Free Wi-Fi and free public parking are available on site. Each room at Campanile Calais includes a private bathroom, tea and coffee making facilities, and an LCD TV with cable channels. Fresh fruit and pastries are served in the buffet breakfast every morning. The restaurant proposes regional specialties and buffet-style starters and desserts. Campanile Calais is 2.2 km from Calais-Ville Train Station. The A16 Motorway access is a 5-minute drive away. Calais (French pronunciation:; in English often, traditionally /ˈkælɨs/; Kales) is a town in northern France in the department of Pas-de-Calais, of which it is a sub-prefecture. Although it is by far the largest city in Pas-de-Calais, the department’s capital is its third-largest city of Arras. The population of the metropolitan area at the 1999 census was 125,584. Calais overlooks the Strait of Dover, the narrowest point in the English Channel, which is only 34 km (21 miles) wide here, and is the closest French town to England, of which Calais was a territorial possession for several centuries. The white cliffs of Dover can easily be seen on a clear day. The old part of the town, proper (or Calais-Nord), is situated on an artificial island surrounded by canals and harbours. The modern part of the town, St-Pierre, lies to the south and southeast. Lonely Planet France (Travel Guide). Lonely Planet France is your passport to the most relevant, up-to-date advice on what to see and skip, and what hidden discoveries await you. Climb the iconic Eiffel Tower, explore the mysterious abbey-island of Mont St-Michel, or taste Champagne amid the rolling vineyards of Reims; all with your trusted travel companion. Get to the heart of France and begin your journey now! Looking for a guide focused on Paris? Check out Lonely Planet’s Paris guide for a comprehensive look at all the country has to offer; Discover Paris, a photo-rich guide to the country’s most popular attractions; or Pocket Paris, a handy-sized guide/handy-sized guides focused on the can’t-miss sights for a quick trip. Take A Break Holidays takeabreakholidays, Calais Accommodation. San Francisco De Asis, Urb Marina, San Fulgencio, 03177, Alicante, Spain.